We know our Kreamy Soaps® Premium Pine Tar Olive Bar will be the finest bar of soap you will ever use. Our special recipe creates an extremely thick, rich, luxurious, sudsy lather. Our methodology is simple yet complex. We hand craft from start to finish blending our own unique proprietary soap base and fine ingredients. We mix and pour our formula into small wooden soap pans and slowly bake to perfection. We then hand cut, stamp and package these bars just for you. This is real honest to goodness "scratch made" soap. Our happy customers use our Pine Tar Olive Bar for acne, eczema, psoriasis, aging, dry skin, dandruff etc. And of course for their pure bathing pleasure. Our Pine Tar Olive Bar is durable, vegan and all natural. No GMO's, colorants or perfumes are added to this truly amazing bar. No More Itching, Rinses Clean, Your Confidence Restored. Face, Body, Shaving and Hair Bar. No more shaving cans, shampoos, conditioners or other bottles needed when using Kreamy Soaps All in One! Handmade from Scratch-not all Soaps are created equal. No pre-made soap base. No Melt and Pour. No Milling. No Private Label Manufacturer. Our own Unique Proprietary Soap Base-Developed by Kreamy Soaps Master Soapers. Making Soap Since 1994. Made in the USA. Product and Package completely biodegradable. No Animal Testing, No Animal by-products. Note: This bar is fragrance free meaning we do not add any fragrance. You can however smell the all natural ingredients. 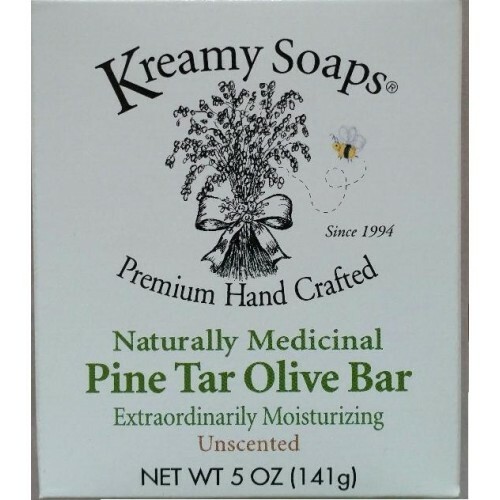 Kreamy Soaps is dedicated to keeping it real and authentic. "You are going to love this bar." Did you know that our Pine Tar Olive Bar is used for all skin types and used for Face, Body, Shaving and Hair? Using our All in One Bar can save you money on shampoo, shaving cream and even moisturizers. If you love quality, then you will love our Pine Tar Olive. This bar is extra creamy and rich in Olive Oil and Jojoba Bean Oil. You will seriously see a difference when using this bar. Your skin and hair will feel soft, healthy and nourished.